From Feb 21 to 22, Chinese Ambassador to Indonesia Xiao Qian visited Banten province, including Serang city, Cilegon city and Pandeglang Regency. During the visit, Ambassador Xiao met with Vice Governor Andika Hazrumy, as well as visited the well-known local Islamic leader Abuya Muhtadi, villagers impacted by the Sunda tsunami, and projects in steel, cement, power generation, etc. constructed by Chinese companies. Economic and Commerce Minister Counselor Wang Liping of the Chinese Embassy accompanied Ambassador Xiao for the visit. 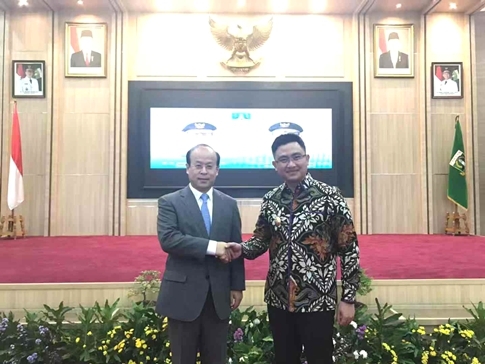 During his meeting with Vice Governor Andika, Ambassador Xiao again expressed his sympathy to Banten for the Sunda tsunami that happened not long ago. Ambassador Xiao briefed the governor on the positive progress of China-Indonesia relations in the past years. 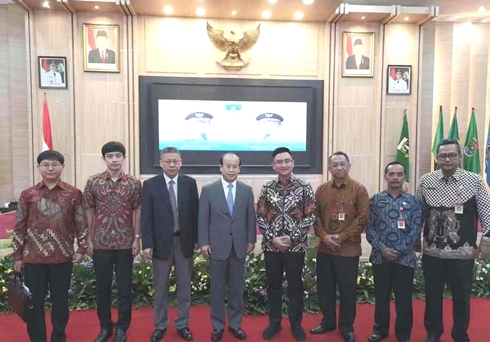 Ambassador Xiao said, the purpose of the visit is to gain deeper understanding of the social and economic situation in Banten, and explore further cooperation opportunities in various areas between China and Banten. Banten has great development potential given it advantageous location, sound basis for industries, and abundant tourism resources. In recent years, Chinese companies have taken active part in cooperation with Banten in areas such as steel, cement, power generation and processing, thus made positive contribution to local economic development. China is willing to step up its cooperation with Banten in sister cities, investment and commerce, and people-to-people exchanges. It is hoped that the Banten government will continue to render support and facilitation for Chinese companies and personnel. Vice Governor Andika relayed warm welcome and greetings from Governor Wahidin Halim to Ambassador Xiao, and expressed gratitude to the Chinese government and people for their kind assistance and care for the people stricken by the Sunda tsunami. Governor Andika briefed the Ambassador on the economic and social situation of Banten and said, Banten is the important corridor connecting Java and Sumatra, as well as an important door to the outside world for Indonesia. In recent years, the economy in Banten has been growing faster than national average, and brought bright prospects for Banten’s development. Banten is ready to establish sister city relations with Chinese cities, and hopes that more Chinese companies will step up their investment to Banten. The province also welcomes more Chinese tourists to visit, and the Banten government is willing to provide more thorough services to Chinese companies and tourists. Banten is located on the west end of the Java Island. It was part of West Java Province and became a province in 2000. Banten has 9663 square kilometers land areas, and 4 regencies and 4 cities with Serang being the capital. Banten has a population of 12.45 million, majority of which are Bantenese, Sundanese, and Javanese, with 95% of the population believes in Islam.